Gemma was born, raised and educated in Wexford. On Completion of her NCVA course in Information Technology and European Studies, Gemma began her search for a career that involved daily interaction with people. She was successful at interview with Equifax Credit Reference Agency, the Worlds' largest Credit Reference Agency, where she joined the new team of Telesales/Telemarketing in Wexford, selling services to the UK. Gemma remained here for two years. There was a decision made however to close this department in Wexford and move it to the UK offices at Birmingham. Gemma was the only team member to be approached and offered a promotional move to the UK to train the UK on the Commercial side of the business and to continue in a Sales capacity. She accepted the offer and at the age of 19, upped and re-located to Birmingham UK. Gemma enjoyed huge success working with Equifax UK and won 11 awards in 12 months for outstanding achievements in sales and revenue generation for the company. In 1999, Gemma became interested in the world of recruitment, therefore set about researching companies in this field. Before long she attended an interview and began work at Certes Computing. She began work with Certes Computing, a reputable IT Recruitment company based in Solihull, Birmingham. She gained great experience here and after 6 months, Gemma discovered that there was a position available with Adecco Recruitment Solutions. She attended an interview and was offered a position to work as a Consultant for them at their Wolverhampton branch. Gemma accepted the offer and started her career with Adecco on 3rd March 2000. Her success began very early on with Adecco, where she won 3 awards within her first year, bringing her branch from bottom of the league to 2nd in her region. When she made the decision to re-locate to Cambridge, she was offered to stay with the company and take on the role of Permanent Consultant with the Cambridge branch. She gladly accepted and continued her repeated success at the Cambridge office. She trained new Consultants to the region and offered support and advice to all colleagues she worked with. In 2003, Gemma was getting itchy feet and was longing to return to her roots in Ireland and made her feelings known to Senior Management within the organisation. In February, Gemma was approached by the UK CEO and offered the opportunity to return to Ireland and set up the new Waterford branch of Adecco and manage the Southeast division. She delightfully accepted the promotion and on 03rd March 2003, she launched the Adecco Waterford Offices. Gemma had great success with Adecco Waterford for over two years, however in September 2005, a global decision was made to close over 50 branches throughout England and Ireland. Unfortunately, one of those branches was the Waterford branch. The offices closed on 07th September 2005 and Gemma was made redundant. Gemma stayed in contact with all of her colleagues and clients alike and due to constant requests, along with her urge to enter the working arena again, she made the decision to open her own Recruitment Consultancy. The jobs market is a very competitive area these days and that is why it is best to leave it to the experts at Gemma Hayes Recruitment. Wexford Woman, Gemma Hayes has over 15 years of hands-on recruitment industry experience, working across all role and industry disciplines, therefore is well placed to provide a professional and high end recruitment service. Gemma's passion is people and she remains determined to offer candidates and clients alike, a service that stands out from other agencies, spending the time to really get to know and fully understand the requirements of all whom engage her services. 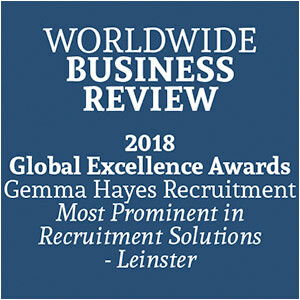 Gemma has established and developed strong and lasting business relationships throughout Ireland and Internationally and she certainly has the talent, skills, the experience, drive and extreme dedication to bring the world of recruitment to an entire new level.